This week I’m going for the green! 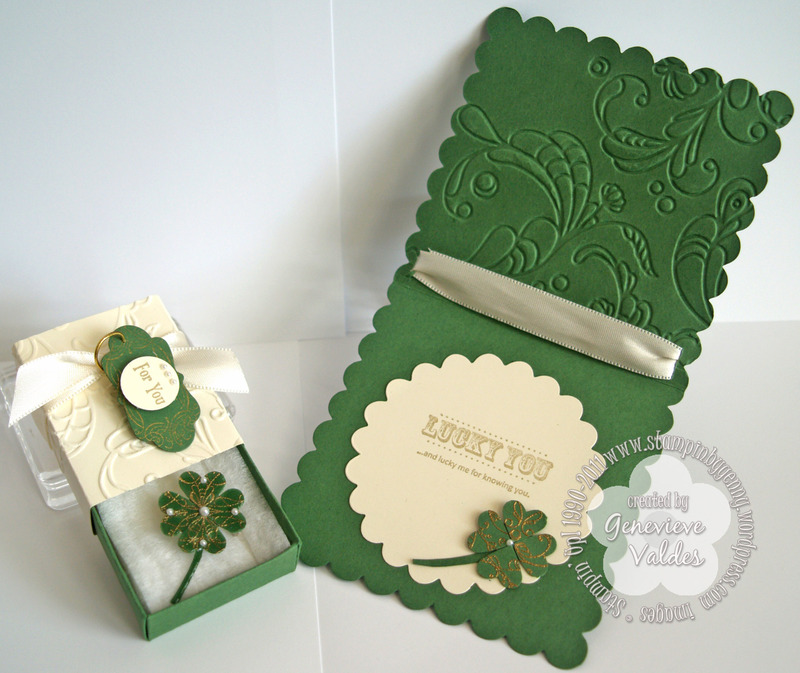 Hand Stamped Sentiments has a fun challenge this week to create any project inspired by St. Patrick’s Day. My idea for this challenge was inspired by the flourish in the Always Elegant stamp set by Stampin’ Up! 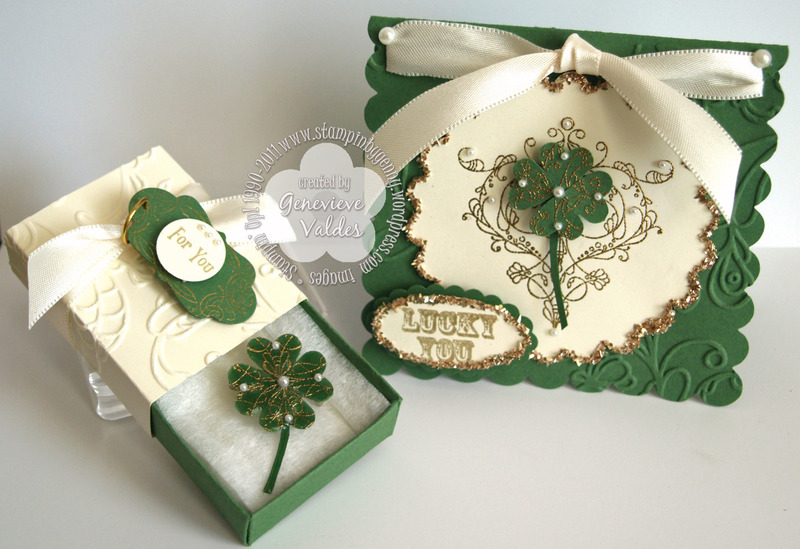 I knew instantly I wanted to create a lucky four leaf clover jewelry pin gift set that featured this beautiful flourish. Since I had not played with my Crystal Effects this was perfect for the pin I had in my mind. I first stamped the flourish from the Always Elegant stamp set and heat embossed it with gold then punch four hearts with the small heart punch. I punched a 1/2″ circle and adhered the hearts to the circle with a mini glue dot then adhered the stem to the back. I covered the front of the clover pin with Crystal Effects then let dry overnight. I embellished with pearls and adhered a 3/4 inch silver safety catch pin back with hot glue gun. The box and tag for the pin were created with the Sizzix Matchbox Bigz XL die. I first ran the CS through with this die then embossed the top of the box with the Elegant Lines embossing folder before putting it together. I wrapped the box with Very Vanilla satin ribbon. The green tag is stamped with gold ink with the oval from the Vintage labels then stamped the ‘FOR YOU’ also from this set and punched it out with the 3/4″ circle. I adhered the circle to the tag with dimensionals then tied it to the ribbon with gold cording. The card base was cut with the Sizzix Bigz Large Scallop Square die and then embossed with the Elegant Lines embossing folder. I used the Scallop Circles #2 die for the second layer. I stamped it with the flourish from the Always Elegant stamp and heat embossed it with gold then used Champagne Glass Glitter on the edges of the scalloped circle. I made another four leaf clover and adhered it to the flourish with a dimensional. The sentiment is from the Hostess Level 1 Aftherthoughts stamp set punched out with the large oval punch then outlined with Champagne Glass Glitter. I then layered on a scallop oval and adhered with dimensionals. I hope you’re inspired to create some St. Patrick’s day projects. 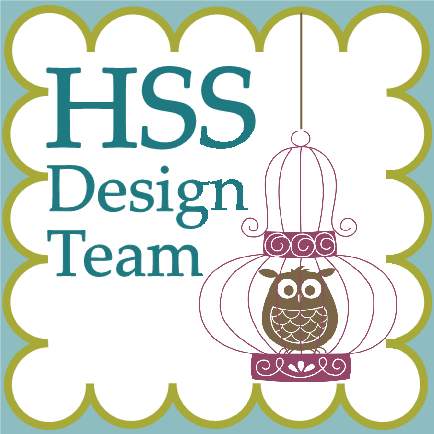 Hop on over to Hand Stamped Sentiments and see more inspiration from our talented design team. You did a much better job with your set than I did! Great job!